Unlike CBD, which has skyrocketed in popularity, CBG (Cannabigerol) is still relatively obscure, even though it has many beneficial properties much like CBD and THC. We think it’s about time everyone got to know this beautiful cannabinoid better! 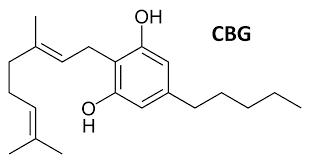 What is CBG and what does it do? which means that it can’t get you high. It goes without saying that these are all vital functions. Both cannabinoids and a properly regulated endocannabinoid system are essential for one’s body and health. CBG, like CBD, can help restore balance and promote overall well-being. However, both cannabinoids have their own unique characteristics and interact with the endocannabinoid system differently. When CBG, CBD, and THC are used together, they may produce a stronger effect than any one of those components alone, thus becoming greater than the sum of their parts. This synergy is referred to as the entourage effect. When two or more types of cannabinoids are used alternately and/or combined, its users may fully benefit from the ultimate entourage effect. Medihemp has recently added bottled 5% CBG oil to its already wide and varied assortment.